Artworks – "Unique Finds For Your Home and Life"
"Unique Finds For Your Home and Life"
April 5 – First Friday, Gettysburg Style We Love Our Pets! Each month we will be collecting donations, monetary or otherwise, for local non-profits. April is Pet Month and we are collecting for our two local non-profits, Forever Love Rescue and Adams County SPCA. You can click on their links to see what items are on their wish lists. Join us this Friday, February 1 for First Friday, Gettysburg Style. Since it is the month of LOVE, we would LOVE for you to take advantage of our “Red and Pink” sale. Any item in the store that has Red AND/OR Pink on it is 10% off (including clearance items). Join us Saturday, December 1 for Gettysburg’s 1st annual “A Gettysburg Christmas Festival. There will be lots of activities throughout the town and in various shops. Artworks will have free hot chocolate with choice of topping; whipped cream or marshmallows. We are also offering 10% off of a single Beyond Borders Haitian Metal Art item AND 15% off of our already marked clearance items. Make a day of it! Refer to http://www.agettysburgchristmasfestival.com and see what’s happening on each street. You don’t want to miss a thing. Too far to carry? We’ll hold your purchases for you. The holiday season is always about hustle and bustle. We realize you are so busy shopping and dragging packages back and for to where your car is parked. So we want to make it easy on you. Purchase something at Artworks and we will hold your package(s) until you’re ready to pick them up. All we require is your name and phone number and if you haven’t picked up your items and it’s close to closing time we will call you 1 hour before we close to remind you. Willow Tree Ornaments Are Here! We decided to try something new. We’ve always liked Willow Tree figures but there was already a local dealer in town. As soon as we found out that shop decided to relinquish their dealership we JUMPED at the opportunity to have these wonderful items in our store. We are starting small; literally. The first items we’ve decided to bring in are the ornaments. These aren’t holiday ornaments, they are everyday ornaments that you can give and display all year long anywhere! The ornaments displayed in the picture are ones we have in stock. We will certainly take special requests and will look to expand our line past just ornaments. We just wanted to test the proverbial waters first! We hope you’re as excited to have Willow Tree available at Artworks as we are. November is just around the corner and we’re all ready to relax and unwind for another First Friday, Gettysburg Style. This First Friday we will be featuring wine from Halbrendt Winery (www.halbrendtwinery.com) and grapevine wreaths by local artist Andi Donahue. Andi cuts and uses grapevines from Halbrendt Winery for her wreaths. 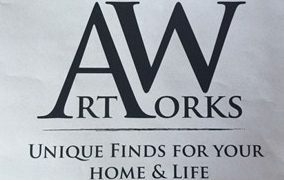 Artworks is a collection spot for donations for homeless veterans. We will be collecting November 2 – December 9. A list of items below are needed for men and women. Only new/unused items should be donated. December 1, A Gettysburg Christmas Festival 10am-9pm – A town wide festival from the center square out to Steinwehr Ave.